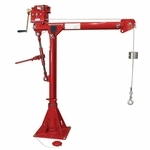 The Commander 1000 series is a new medium-duty portable davit crane from Thern. Use it for lifting up to 1,000 lbs. It is available in a variety of finishes and can be paired with a number of different mounting bases. You can also choose between a manual or electric winch for super easy, highly controlled operation. It features an adjustable and extendable boom--it extends to four positions with quick-release pins and the boom angle adjusts with a ratchet. It also rotates a full 360º under load thanks to roller / ball bearings. The new rotation handle does not interfere with operation of the ratchet.